Ripe star fruit are primarily yellow in color with tinges of green and dark brown along the ridges. The skin should be firm to the touch. When the fruit is entirely yellow with brown spots all over the skin, it is overly ripe. The larger the star fruit the sweeter. Ripe star fruit should be stored in a plastic bag in the refrigerator for up to two weeks. Wash the star fruit and cut it in vertical slices, so you get star-shaped slices. Place the slices in a single layer on a baking sheet and place in the freezer. Once frozen transfer the star fruit slices to a freezer container and store in the freezer. 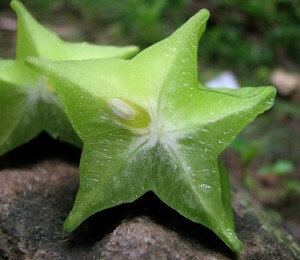 Some people prefer to eat a star fruit when it is still light green and firm, with a more tart taste and crisp bite. However, if you purchase a star fruit that is still green you can ripen it on the counter at home. Turn the fruit daily to insure even ripening. Once the fruit is fully ripe store it in the refrigerator to slow the ripening process.